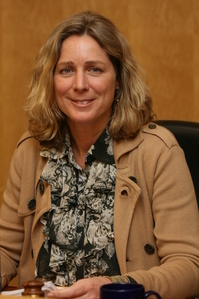 Posted on Fri, Feb 3, 2012 : 11:30 a.m.
Gretchen Driskell , Saline’s longest-serving Mayor is considering a run for state representative as a Democrat and is forming an exploratory committee. Driskell, 53, is considering challenging Mark Ouimet, of Scio Township, a first-term Republican representative in the 52nd District, which encompasses all of western Washtenaw, as well as the City of Saline and Saline Township. “I thought about running two years ago,” Driskell said, and was approached this year when Christine Green decided not to run for the seat. Green lost the election to Ouimet in 2010. “I was asked to consider it, and I’m looking at it very seriously,” said Driskell, who is up for re-election this year. Saline's elections are non-partison, but Driskell, calling herself a moderate, said she is “most closely aligned with the Democrats." Driskell said she has until May to decide, and she is working on an election platform that includes education, jobs, and the economy. "I am concerned about the future of the state and the long-term impact of the decisions that are being made right now," she said. She said it’s still too early in the process to cite specifics. Driskell, a mother of three children, ages 17 to 24, has served on numerous national, state and local boards including the National League of Cities, the Michigan Municipal League, the Southeast Michigan Council of Governments and the Washtenaw Area Transportation Study. Lisa Allmendinger is a regional reporter for AnnArbor.com. She can be reached at lisaallmendinger@annarbor.com. For more Saline stories, visit our Saline page. Sun, Feb 5, 2012 : 2:37 p.m.
Fri, Feb 3, 2012 : 10:52 p.m.
@Huron74 People do not run for office because it is a better gig, that is what got us into trouble in the first place. Ouimet and the republicans have us on the right track and we need to let them finish what they started. Sat, Feb 4, 2012 : 2:02 p.m.
Fri, Feb 3, 2012 : 10:49 p.m.
Kristen, I must say that I was not surprised to see that you will be supporting Gretchen when and if she decides to pull the trigger. However, I would like a little bit more substance if you would be so kind. What experience does Mayor Driskell have when it comes to business? What experience does she have when it comes to working in a bipartisan manner? What experience does she have actually working? I ask this because we are lucky enough to have a current Rep. who has boat loads of experience in all those important factors and more. If she runs and if elected Gretchen will be almost certainly be serving in the minority. This will mean that she has to come to the table and be willing to compromise I have seen no evidence she has the ability to do this. What experience does she have in business an job creation the short answer in none. The unfortunate mindset we have to is throw out the incimbent, who I happen to like and respect. Mark has been forced to make some tough votes but they were votes that needed to made. I for one will be splitting my ticket and doing my part to send Ouimet back for at least two more years. Sat, Feb 4, 2012 : 2:26 p.m. If you really are an &quot;A2democrat,&quot; you will not be able to help send Ouimet back for two more years. The GOP legislature talk all of the City of Ann Arbor out of his district to make it more safely Republican for him. Fri, Feb 3, 2012 : 10:40 p.m.
@Bob Martel every time there is an article on here about Ouimet you have a negative response. May I ask why? Please back up your statement that Ouimet is bought and paid for if you can do so I will listen to your argument but I highly doubt that you can. I submit that your motives are both personal and in my opinion slightly pathetic. I think the reason you log on here and bash Ouimet is that he won an election nobody thought he could win, an election in which you were a key player for the opposition. Do I agree with every vote Mark has made no, but I have let his office know and always received a response. That being said, at least the current legislature is actually doing something, Again, I don't like all of it but they are taking action which is something that has not happened in Michigan for years. Michigan still has much work to do but progress has been and Mark Ouimet played a part in the progress. Sat, Feb 4, 2012 : 2:23 p.m.
Ouimet &quot;won an election that nobody thought he could win?&quot; The GOP thought that seat was &quot;in the bag,&quot; and the state Dems virtually wrote it off until they belatedly saw how vulnerable Ouimet record's was. The previous 52nd district, which Ouimet won, was drawn by Repuvlicans to be Republican, and had a partisan baseline of about 53R-47D. Win some good candidates amd hard work, Dems won it for many years. With no incumbent Dem, and 2010 a state and national sunami for the GOP, Ouimet barely hit that baseline. His scandals involving excess per diems, a bogus college degree, etc. almost did him in, despite the advantages he had. Fri, Feb 3, 2012 : 7:10 p.m.
Maybe TreeTowns Mayor will be inspired to do the same! Fri, Feb 3, 2012 : 5:51 p.m. Most high profile case I know that shows where Michigan politician's heart is is the proposed new bridge to Canada. I wrote Rep. Ouimet asking where he stood and got back a milquetoast response which to me indicated he was with money bags Moroun on this one...well if that doesn't change he will be down one vote this fall. Sun, Feb 5, 2012 : 2:35 p.m. Sat, Feb 4, 2012 : 11:51 p.m.
Ouimet has stated several times that he supports the bridge. Sat, Feb 4, 2012 : 9:05 p.m. I wold like to know if he received money from Moroun. An article in the Freep recently reported Moroun has bought a lot of votes. I can't support him either is he opposes the bridge. Fri, Feb 3, 2012 : 7:35 p.m. I'm a little surprised @ Ouimet's position on the bridge, I thought he was trying to align himself with Snyder. Oh well, he's another one of that crew that's bought &amp; paid for. Time for him to go. Fri, Feb 3, 2012 : 5:48 p.m.
Fri, Feb 3, 2012 : 6:46 p.m.
Business seems to be doing very well in Democrat controlled Ann Arbor. Fri, Feb 3, 2012 : 5:44 p.m. Article should read: Mayor Driskell has done all she could to expand local government...time to expand. Fri, Feb 3, 2012 : 5:18 p.m. Thank you Gretchen for your willingness to continue serving. You will have my personal and financial support for this important state government seat. The residents of Washtenaw County deserve a state representative who will work for the people and make good choices for our children, families and businesses. I have no doubt you are the person we need in this seat! Fri, Feb 3, 2012 : 5:11 p.m.